Anneliese attended the University of New Hampshire and serves as our Administrative Assistant and Website Manager. In addition to general office administration, she is responsible for the underwater video archive, and transcribes the recordings. MER's video library includes more than 1,800 recordings on 620 tapes covering 530 hours . 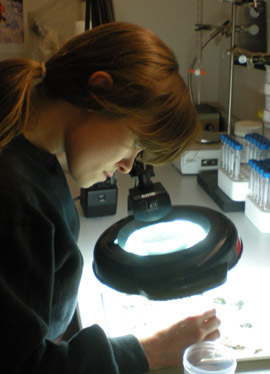 Anneliese also assists with pre-sampling preparations and, in the laboratory, with the sorting of marine benthic infauna samples. Anneliese compiles and edits reports, including the development of graphic representations of sampling strategies and video recordings. Anneliese is also an artist, and she enjoys photography and audio recording.